Securitex EmerPhone - emergency or hotline telephone entry systems are the perfect choice to admit visitors to a secured building or chemical facilities. EmerPhone single user telephone entry systems allow a visitor to contact a plant manager or security desk to gain admission to a chemical or oil and gas facility. They come with a wide range of options to accommodate any need. This includes vandal proof housings, volume adjustable privacy handsets and relays to activate strobe lights or bells in high noise environments. Modules are available to fit inside automated gate post or other supplied equipment. Using the Securitex EmerPhone is simple. The person requiring entry simply presses the call button. For handset unit, the number is automatically dialed by lifting the handset and no button needs to be pressed. A pre-programmed telephone number is then dialed. An LED shows red to indicate the call has been placed. The LED turns green when the call has been answered to assist hearing disabled persons who may not hear the answering attendant. The person receiving the call can open the door or gate by simply pressing 16 on their phone. The Securitex EmerPhone can be programmed with an alternate back-up number that will automatically dial when the first does not answer or rings busy. In this way a security guard who is away from his station or a resident who is not at home can automatically receive intercom calls on their cellular phone. If the Securitex EmerPhone is on a dedicated PSTN line, the attendant can also call into the unit at any time to communicate with the caller. 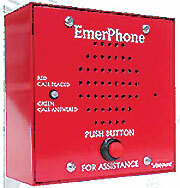 Securitex EmerPhone units can be programmed in one of two ways. They can be programmed remotely by touch tone or on site using a removable programming keypad. Flexible instruction options – Securitex EmerPhone unit come marked Emergency, Assistance or blank and can come with etched Braille lettering. Other formats may be ordered upon request. Vandal proof – Securitex EmerPhone units come in a variety of enclosures including reinforced 14-gauge stainless steel surface or flush housings. Keypad dialing – Securitex EmerPhone systems can be ordered with a keypad to allow personnel to dial telephone extensions rather than a single number. All Securitex EmerPhone models connect using an RJ11 jack. Please call for additional model specific specifications. 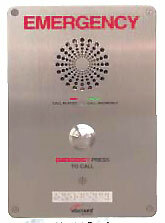 The Securitex Emerphone is highly suitable to be used in an unman remote facilities where communication between facilities are miles away or cabling between the remote site and the main security office is impossible, like nuclear facilities, Oil and Gas facilities, Petrochemical and chemical complex. Poisonous gas facilities like, Ammonia, hydrogen sulphide, Chlorine, Carbon monoxide etc. Oil field and off site chemical manufacturing facilities can also use this system for operator to communicate with the control room if they need help.